The Governor of the Commonwealth of Virginia serves as the chief executive of the Commonwealth of Virginia for a four-year term. The current holder of the office is Terry McAuliffe, who was sworn in on January 11, 2014. His term will expire on January 13, 2018. 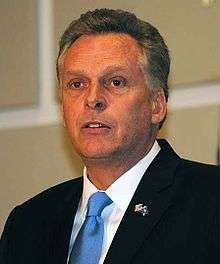 McAuliffe is a member of the Democratic Party and was elected to the office on November 5, 2013, to succeed Republican Bob McDonnell. 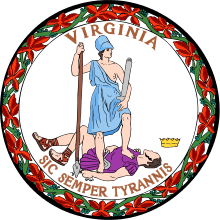 Virginia governors are not allowed to serve consecutive terms; therefore, they cannot stand for reelection at the end of their term, as per the 1830 state constitution. However, a former governor is permitted to run for a second term in a future election. 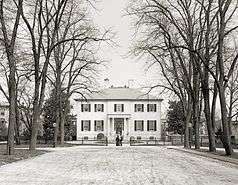 Only two governors since 1830, William Smith and Mills Godwin, were elected to additional terms. Smith's second term came after Virginia seceded from the Union, while Godwin became the first ever governor in American history to be elected by both major parties when the former Democrat was elected in 1973 as a Republican. 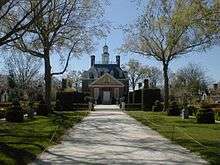 In 1624, the English Monarchy took control from the Virginia Company and made Virginia a crown colony. Governors continued to be appointed by the monarch for many years. 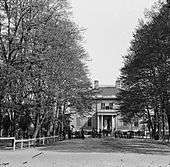 Most often, the appointed governor would reside in England while a deputy or lieutenant governor actually exercised authority. Royal rule was interrupted during the English Civil War, after which governors were appointed by the Commonwealth of England until the English Restoration. ↑ "Constitution of Virginia". Retrieved 16 October 2013.